I've often wondered why those pics are in the Hackney Gazette. Of course.... it's for the kids to point themselves out to the rest of us... on their first steps to greater fame. Aren't there a few more of our kids in the tho. I'm sure I can spot a couple more. Could you do a picture with ALL of them? 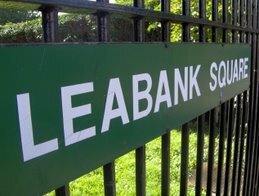 Leabank Square Fact No. 4002. The mural behind the kids was painted by none other than Zoulla!! Most of us have met this incredible artist by now - and we've definetly seen some of her work on this very blog! There will be some more exciting art news coming this summer (2008) - so watch this space!